I met the hosts of the iPod Traveller podcast, Nick and Opal today. This is by far my favourite podcast – officially it’s a travel show, and it’s informative enough at that but it’s also absolutely hilarious listening. I had read on their site that they were doing a trip to Paris on Eurostar and as I walk past the terminal on the way in to work I dropped by to say hi. Sadly they were running late so we could only chat for 5 minutes before they had to check in. I didn’t even have time to take any photos. They tried to persuade me to join them but some combination of no passport and having to go to work stopped me. Next time I’ll be a bit more organised and join them for sure. After they went I wandered around and took some photos before heading into work for the day. I have changed my blog code so that it now allows me to attach tags to posts instead of filing them into one-dimensional categories. Of course, for it to have any meaning I have to go back to old entries and add relevant tags. Or train a monkey to do it. I’ve also updated my CD List code. Since I ripped all my CDs to disk and no longer play CDs on my PC it was never being updated. Now that I stream my music from home to work it makes sense for it to update when I play a CD that way – so I made that change. In essence, when I play a CD in my streaming app, it sends off a HTTP POST to this site which then adds an entry into the database that tracks what I played and when. The last part of that was to put together a quick script to insert historical data for all the music I was streaming over the past year or so. Fortunately, I had had the foresight to collect that data locally in anticipation of this change. The next steps are to track music that I play on my iPod and on wiphi. Photos from my recent trip to New England; more on Flickr. One of the annoying things I discovered when I got back from my holiday was that I seemed to have picked up some annoying dust spots on my camera sensor. Aside from learning how to use the clone tool in Photoshop I also ordered an “Arctic Butterfly” from Visible Dust. After reading good things about it at Luminous Landscape I hoped it would fix my dust problems. It arrived today and I tried it out just now and it has worked incredibly well. I can’t see a single spot, and I counted about 20 in the test shot I took before cleaning. So, no more cloning for me! The other annoying thing was that the iPod that I had been storing photos on whilst on holiday managed to corrupt about 10 of my photos. I have no idea what went wrong – several hundred others were fine. 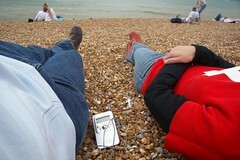 As long as the iPod can’t view RAW files, there’s always a chance that this could happen again. Serves me right for not buying a dedicated photo storage device I guess. Once upon a time, I bought a radio – a portable digital radio no less. Life was good – I listened to that radio on the bus to work – and at work – and on the bus on the way home too. Then, I moved out into the sticks and started catching the train to work. The commute was longer but the radio served me well. 6 Music was my station of choice. A station for people that are too old for Radio 1 and too cool for Radio 2 as The Guardian once called it. The station that once played the full version of Marquee Moon by Television on the breakfast show (I was sat on the train grinning like an idiot when they did that). Completely advert and shite music free – I really enjoyed it. Then one day, South West Trains introduced new trains. New comfortable trains – with comfier seats, and aircon and all that kind of stuff. That and some clever “feature” that completely blocks the signal of my radio. At first it was the occasional train – that I could deal with. Eventually I gave up using my radio, it now sits at home, gathering dust. It has occasional outings – like when the cricket is on. And I’ve since bought an iPod. I really miss that little radio. I went to Wales for the weekend, to the home of the GLC. I travelled there with my brother, who has a very cool car stereo. It allows you to connect an iPod to it, then displays track titles and lets you browse the music on the iPod itself. I was very impressed and I don’t even own an iPod. I also noticed that people in Newport are obviously huge Goldie Lookin Chain fans, they dress just like them! Strange definition of the word “rival”.